More Dredd! This time from the very tail-end of Starlogged's period: The first issue of CLASSIC 2000AD (September 1995), yet another outlet for reprints from Tharg's repository of thrills. C2000AD was the successor to the (far more successful) BEST OF 2000AD MONTHLY. That had churned-out low-cost reprints for a decade and pretty much exhausted the back stock of black & white material from the venerable weekly. This new launch featured colour interiors, allowing it to plunder more recent material from the weekly as well as Dredd's spin-off solo book. I don't have every issue but - presumably - it also opened-up the possibility of pulling rarities from the various spin-off annuals and specials which had different page dimensions than the weekly and BEST OF. Fleetway's other motive: C2000AD appeared, alongside a similar reboot for the 1992 launched THE COMPLETE JUDGE DREDD (reworked as CLASSIC JUDGE DREDD), just as the 1985 JUDGE DREDD movie hit cinemas. Fleetway anticipated a sales bonanza and ensured they had plenty of shiny new product on the shelves (the kid-friendly fortnightly LAWMAN OF THE FUTURE appeared at the same time). Unfortunately, the film was something of a flop (I'm going to stick my neck out here and say that - although it's no cinematic masterpiece - it's not a total train wreck either) and none of Fleetway's 2000AD family of titles saw much (if any) benefit from the association. 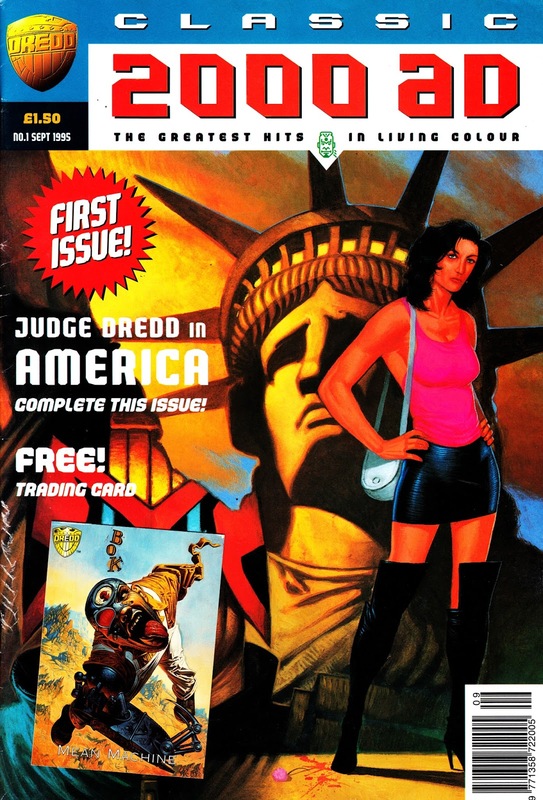 C2000AD shuttered after a mere 15 issues (compared with 119 editions of its predecessor), closing out in January 1997. Its' Dredd companion managed another three issues: the 18th was the last (compared with 42 from the first run). The lead reprint was America, the highly regarded JD strip that had kicked-off the Megazine five years earlier. Have to agree. There's nothing wrong with the Stallone Dredd movie, despite its flaws it caught the tone of the comics well. Where it fell down was that the story didn't seem to ever come to much, despite its promise. I'd say that, objectively, launching with a story where Dredd is framed and no longer a Judge was a limiting decision - he became the cliched cop who solves the case after being suspended, rather than establishing him as the infallible lawman we'd expect in a first film. As with the recent Dredd movie outing, it remains a surprise to me that movie producers want to hold back Judge Death for a sequel film (that doesn't materialise). The Spider-Man movies stuck Green Goblin front and centre, Thor had Loki, Captain America had Red Skull - translating these characters to film, you'd ideally hit the ground running with your best bad guy, surely? At last, someone else who doesn't instantly dismiss the 1995 film as a disaster! Hurrah! I saw it at the cinema at the time and remember leaving thinking "not brilliant... but not bad". I tend to agree with you that the Dark Judges would have made for a stronger movie (either time) but I guess they feel the need to introduce the world of the future before they start adding supernatural elements to the mix. Maybe they think science fiction AND supernatural would be information-overload for casual punters? As an aside, I knew someone (we were on the same university course) at the time who was a Mega City One extra. He was a (real life) punk and appeared as one of the citizens of the Mega City in the Shepperton (?) exteriors. He returned with glowing reports of the impressive scale of the production. Lucky so-and-so.